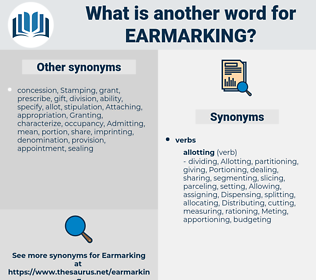 What is another word for Earmarking? disbursements, allotments, designations, sums, appropriations, Appointments, placements, uses, secondments, deployments, attachments. 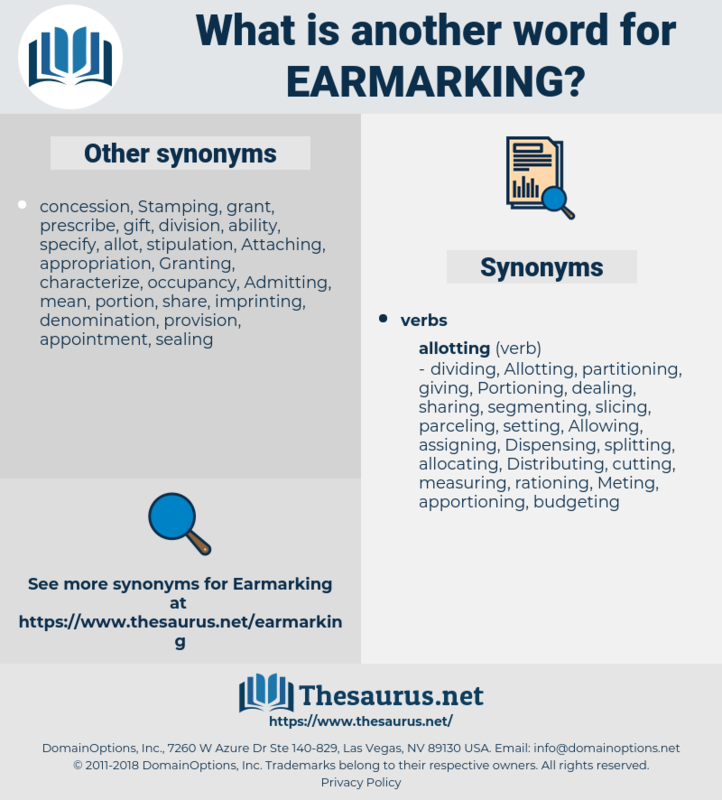 reallocating, privatizing, apportioning, Impairing, Granting, diverting, mobilising, Distributing, caregiving, Nominating, Consecrating, recording, Allotting, Restraining, Designating, projecting, resourcing, expending, Adjudicating, restricting, appropriate, Appropriating, Dedicating, Anticipating, Prescribing, Consolidating, Reserving, Enshrining, Devoting, disclosing, Curtailing, assigns, Channeling, jeopardising, monitor, monitoring, Influencing, impinging, identifying, Deploying, Tendering, foreseeing, observing, crewing, retaining, specified, preserving, Committing, forecasting, affecting, awarding, Embodying, Predicting, entrenching, appointed, limiting, funding, detecting, Conferring, serving, Afflicting, compromising, Employing, directing, interfering, Impacting, Disposing, filling, Disrupting, posturing, giving, Dispatching, pouring, Maintaining, hitting, Tagging, expensing, pushing, Applying, selling, Attaching, Nailing, booking, Effecting, touching, putting, Channelling.